The Crosbies take special care of people and justifiably garnered much praise in various publications and tour guides for the splendour and comfort of its rooms, and the hospitality of its proprietors, Tom and Ann. Glendine House was presented with Georgina Campbell’s Irish Farmhouse/Guesthouse of The Year award for 2006. This much-coveted accolade confirms Glendine’s status as the establishment par excellence. Glendine Country House has also been featured in the Irish Times, Sunday Independent, Food and Wine Magazine and several other publications. Glendine Country House is a family run period house set on its own grounds and overlooking the Barrow Estuary on the Hook Peninsula. The 18th Century former Dower House of the Marquis of Donegal was built in 1830. It was first occupied by the Chichester family and later by land agents until one of them absconded with a Nursery Maid causing a great scandal. Home to the Crosbie family for over 70 years, Glendine retains many of its original 1830 features and is full of old world charm. 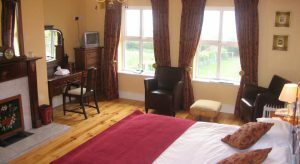 The House is set high up over the village of Arthurstown and all of the rooms are stylishly beautiful and have magnificent sea views. The Jacob was traditionally a parkland breed but it is now much more widespread and is found in every part of the British Isles and Ireland. It is an alert and attractive sheep. Its white fleece has well defined black patches, the head and neck being mostly black with a white blaze. Both sexes are horned and there can be either two or four horns. The ewes are hardy and excellent mothers who milk well, frequently having twins or triplets giving a realistic 200 lambing percentage. The finished lamb is tender and lean with an excellent flavour and can be seen on the menu at Glendine’s Restaurant. The fleece has a wide appeal to spinners and weavers and the natural undyed colours make elegant and distinctive garments for the top end of the fashion market. The Jacob Sheep Society, which is a registered charity, (No. 1026687), was founded in 1969 to save and promote this unique sheep. It is very supportive and flourishing Society with around 800 members.